From Saturday 16th – 30th April 2016, for every purchase of £5 or more in one of the participating traders listed below makes you eligible to enter the prize* draw. Hang on to the draw tickets you are given with your purchase for proof of purchase. 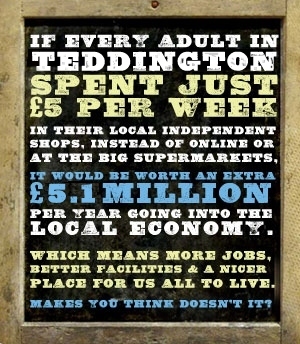 The more you shop locally, the better your chances are of winning! 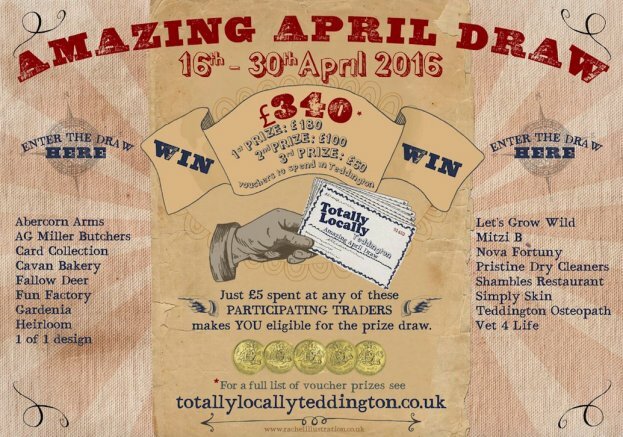 There will be £340 of local shop vouchers* to win and spend in your lovely local high street! Keep an eye-out for the posters in shop windows that will indicate that money spent within will increase your chances of winning. Who doesn’t like a shopping spree? Well how about helping to support your local independent traders by going on one with the chance of winning a huge free one! 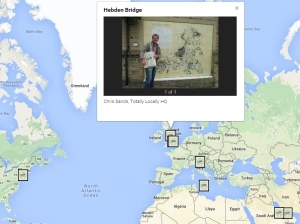 The Prize Draw will be held on Tuesday 5th May 2016, 6:30pm at Shambles. Prize amounts will consist of £20 vouchers from the participating 17 traders (listed above). Email addresses are collected on ticket stubs so that we can contact the winners. So basically, fear not, we would never pass on your details to anyone and ticket stubbs will be destroyed in a proper manner which may or may not involved an army of Russian Hamsters. 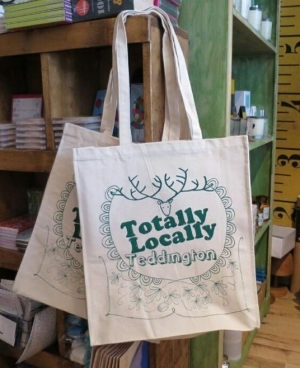 Totally Locally Teddington is not an official body. We are a group of people just trying to do nice things for our town. So we can’t guarantee prize vouchers* and tickets are only while stocks last. Terms & Conditions apply to the voucher prizes from the individual shops, but to be honest, if there was a problem, have a word with the friendly shopkeepers and they will sort you out with something great. Because that’s what this is all about. Thank you. The Totally Locally Teddington Team.